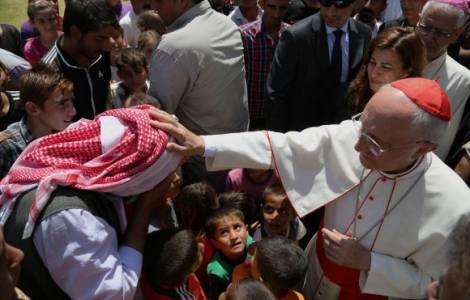 VATICAN - Cardinal Filoni: "The Pope in the Arabian Peninsula: a sign of hope"
Vatican City (Agenzia Fides) - "The Pope's visit can help promote Islamic-Christian dialogue. But it must be said that we do not start from scratch and too many times only the most problematic or negative aspects are highlighted... The basis already exists, we can make progress: the fact that the Pope visits the Arabian peninsula for the first time is a sign very positive, a sign of hope". This is what Cardinal Fernando Filoni, Prefect of the Congregation for the Evangelization of Peoples, the Vatican dicastery that has jurisdiction over the Apostolic Vicariates in the Arabian Peninsula, and on all the Catholic communities of the area, said during an interview with Agenzia Fides, on the eve of the Pope Francis' visit to the United Arab Emirates from 3 to 5 February. Pope Francis is going to the Arabian peninsula: what situation will he encounter, what is the life of local Christian communities like? The Catholic communities present in the great region of the Arabian peninsula are organized into ecclesiastical macroregions: the Apostolic Vicariate of Northern Arabia, which includes Saudi Arabia, Bahrain, Qatar and Kuwait; and the Apostolic Vicariate of Southern Arabia, which includes the United Arab Emirates, Oman and Yemen. Throughout the peninsula, with a large Islamic majority, the Christian presence began with ancient communities of Eastern rite, settled along the coast of the Persian Gulf, which then expanded throughout the Middle East. Today, the presence of Christians in the Arabian peninsula is linked to migrants: there are no indigenous communities, there are some Arab Christians, but they are individuals. How is the life of the Church carried out in the region? At a pastoral level the activity of the Catholic Church is carried out with migrants who are integrated in the societies of the different states and live next to people who profess the Islamic faith. Even in a rather homogeneous cultural context, in each of the different nations of the region there are peculiarities: in some states like the Arab Emirates and Bahrain there is tolerance and openness towards believers in Christ, while in other countries there is a closer control and sometimes because of the current legislation, the Christian faith is penalized; in other cases it is prevented by the action of extremist and violent groups. The Arab Emirates celebrate the year of Tolerance in 2019 and freedom of worship is widely guaranteed. Can they be an example for the rest of the countries of the area? The Year of tolerance celebrated in the Emirates can be an example and an important starting point for the whole region. The first step of civil coexistence is not to fight each other, respect for others and have tolerance for one another. Tolerance is the first step, but it is not the ultimate goal, which is the full recognition of the fundamental rights of all: human dignity, social, civil and religious rights. This is what we must aim at, proceeding in small steps, according to the providential design of God, taking into account the political, cultural and social realities of each nation. Can you describe in particular what the situation in the United Arab Emirates is like, where the Pope is going? In the United Arab Emirates, there is a certain number of Christian presence: there are 800,000 Catholics (including Filipinos, Indians, Pakistanis, Sri Lankans, Bangladeshis and other nationalities) and the same Catholic faithful are diversified into communities of Latin, Malabar and Malankara, Greek-Catholic rite. We are in the Apostolic Vicariate of the South, where the Church seeks to assure to all the faithful an adequate pastoral service and of worship, also thanks to the presence of priests and religious. The Vicariate is very well organized in the various articulations of the ecclesial organs, with the presence of various churches and the liturgies record a massive and lively participation of the faithful. The Government of the Emirates allows the Church to manage schools and it is possible to carry out an educational service for the benefit of children and young people, starting from those belonging to the same migrant families. It should be noted that schools (11 educational institutions in all) are not confessional schools, but are open to all, attended mostly by non-Christian students. Here there is already a certain integration, no proselytism, religion is not taught but peaceful coexistence is lived, and the fundamental values of respect and human dignity are promoted, lived and taught. The service of education is essential and is a service to the common good. What is the situation in the Northern Vicariate, which includes Saudi Arabia like? Also in the Northern Vicariate, where about 2.5 million Catholics live, there is a rather varied composition: there is Kuwait, where there is the presence of Christians of different rites, while in Saudi Arabia we do not have places of worship or recognized communities. It should be noted, however, that even here there is a certain tolerance towards Christians especially in workplaces, where there are baptized workers: here, in a prudent and reserved manner, without ostentation, a minimal spiritual activity takes place that the government knows and does not prevent, as long as there are no elements that disturb social and civil life. It is well known that Saudi Arabia is considered the cradle of Islam and therefore "sacred land". But, when migrants are welcomed, it is necessary to respect their dignity, their fundamental rights and freedoms, also of conscience and faith. In this sense, a perspective can be opened to develop a path in the name of tolerance which, as mentioned, is the first step of coexistence. Saudi Arabia is a full member of the international community fora, meetings, congresses, UN activities, and has economic and political ties with many nations all over the world: if there is respect and friendly relations are established in these contexts, I believe that this same paradigm can also be envisaged at a religious level, as a way forward for the future. Without any contraposition, but based on a relationship of mutual respect, even within the current reality of the country. Will the Pope's visit also have a significance for relations with Saudi Arabia? This is what we hope. In 2017 the Holy Father received an important Saudi delegation in the Vatican and during the meeting there was talk of a common effort for peace and coexistence. The historic meeting between King Abdullah bin Abdulaziz Al Saud and Pope Benedict XVI, held in 2007, in the sign of harmony and dialogue between religions and civilizations should also be remembered. The Holy See already enjoys good relations with representatives of different countries in the region. We are within a journey: this journey is a stage that can open another stretch of road. It is up to each of us to do our own part. Peaceful coexistence is possible here in the West but also in Arabia, where Christian workers contribute to the economic and social good of the country and give a testimony of respect, peace, benevolence. Can the visit contribute to the Islamic-Christian dialogue?